The popularity of the Holman Classic series with magnetic closure has heightened the demand for the same exquisite detail with expanded translation choices! Featuring the same unparalleled interior page design and fine imported papers as its Ultra Thin NIV equivalent, these KJV editions feature our special glazed calf-grained bonded leathers in two popular colors. The magnetic closure protects the gilded page edges and is a unique new feature that has become a popular favorite. 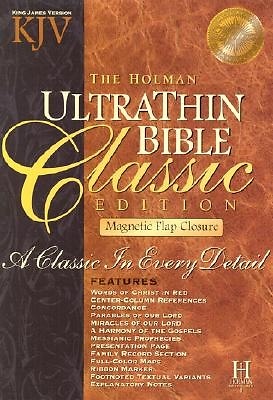 And remember each Ultra Thin Bible Classic carries our Holman Lifetime Guarantee!